Places have personality and one of the exciting things about visiting ghost towns and abandoned rural sites is that, in the quiet, one can get a sense of them. 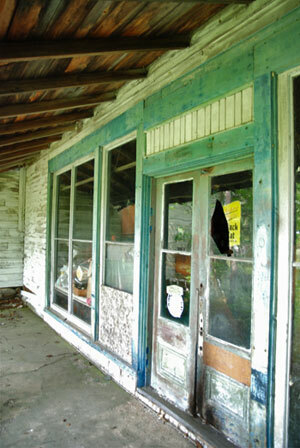 Although NOT abandoned, the old general store is one that has a warm feeling, with its history not too far behind – and like the old beverage signs still clinging to the sides of the building, it is easily discerned by those who might pay attention. 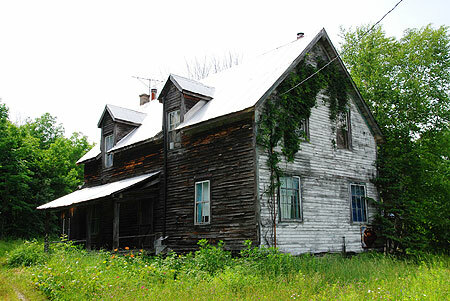 It smiles and wears the overgrowth like grandma’s cloak, still warmed by the latest traffic of ATV’s, snowmobiles and cars that now meet at the crossroads instead of carts and trains. I hope my painting will do this place justice…. With the exhibition only a few short days away, I thought about what I might say. Swords, originally Maple Lake Station, was established in the mid-1800’s for lumbering interests, however, the town really didn’t come in to its own until the arrival of the Booth railway in the 1890’s. The general store was built by the Ludgate Lumber Company in 1894 in order to support the expansion of both lumbering and homesteading in the area. The store became the post office as well in 1897 and with the railway had a short boom era. It was purchased by Thomas Sword in 1900 when the lumber company began to sell its holdings. Thomas ran the store until his death in 1921 and his widow, Lyde, continued with it until 1930. Lyde had issue with the use of tobacco for a time refused to sell it until competition forced her to choose business over principle. A gas pump was added in 1928. The store was the hub of the community and the source of pretty much everything a resident might need. The town’s fortunes were at their height from 1900 until 1930 when the traffic from the railway and the lumber began to decline. The station was closed in 1946 and trains stopped altogether in the mid-50’s. Most of the town quickly faded away and left only the general store, supporting only a very few clients. The town’s fate was finally sealed when in 1967, the post office contract was replaced with rural postal routes and the store was forced to close. Today, there is little to see of the Ghost Town of Swords and the forest is slowly reclaiming what remains. The old general store is the last building standing and is in remarkable shape for a frame building of its era. The residential part of the building remains in use. The family asks that visitors please respect their privacy! I can’t wait to show the painting of this beautiful place. So – I’ll see you at the show… And for those of you too far away to come, I will be posting the new work and stories about the places they were painted over the coming weeks – as well as photos from the opening! 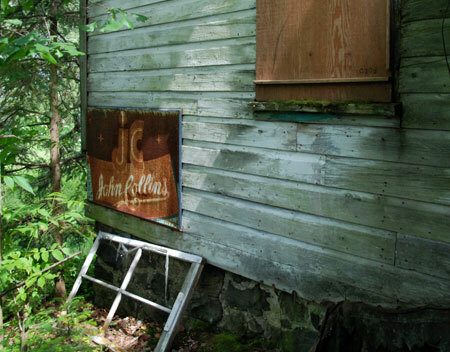 Hind, Da Silva, Ghost Towns of Muskoka, Dundurn, 2008. LOL! I think his intentions were good – Besides, I am normally the bossy one! Threatening; no-no. But your husband might have a point. Your painting might be so good that no one will ever want to look at this historic site again. Hello Michelle and thank you for this post. I think it’s very interesting for the french man i am. Here we don’t have such places. We can find some few ghost villages in france but they were built with stones and not wood. These places are more and more often bought by tourists…. I love your images with the nature just around the houses. I can’t wait to see your paintingof this wonderful old place Michelle. Oh dear – my poor husband! A threat in my house is to get one’s head bitten. Considering the size of mine – there is no damage possible! LOL! Keni – The place is alive and will always be more beautiful. This painting is just a snapshot in time! Welcome Patrick! I am glad you enjoyed the post. Unfortunately nobody likes old buildings much over here. They are only occasionally restored. I live in a tourist town myself – but here it is the building of monster houses on the water replacing the old ones! I am so sorry to see that a sensitive, talented person like yourself, is living in a home where threats, whether physical, mental or emotional are taken so lightly. From your responses to others who have also noticed it, I suspect that perhaps you are suffering from Stockholm Syndrome. If your husband is at the opening and I am able to make it, I will have a few words for him. You, my dear, need protection. Your comment gave me laugh this morning, martin!My poor big bear of a husband is so sweet – Frankly, he is getting a bad rap. I am the mean one for saying such a thing – even in jest! Oh dear! Yes the local shop/post office is the hub of village life. Try telling this to the powers that be who are closing masses of rural POs in UK. They should all be forced to read your Blog article. Lovely story, Michelle! I love your narratives. Your love of the land and the times always comes through. Certainly will wait (although impatiently) for you to post your paintings – for your own safety! Wow… Thanks, Jean! I am glad you enjoy them…. I will start posting the new paintings very soon now! Your painting gives it a softer, gentler look. Really like the painting of this one too.